You remember hearing about the shoulder injuries of tennis player, Serena Williams and football star, Mohamed Salah? The problem our sports Physiotherapist, Troy Dopson, sees within sport is that unless your scapula (shoulder blade) is very stable due to good muscular connections, you are going to have shoulder injuries of different types: Rotator cuff injuries as well as biceps tendinitis and even dislocations. In treating Hong Kong’s athletes, Troy Dopson has noticed that one of the most important things is to completely heal any minor injuries at the moment of occurrence. If we don’t do this through physiotherapy, they accumulate and worsen over time – with scar tissue forming instead of proper healing. Also, the integral stability and full functioning of the shoulder joint is dependent on its muscular support. Our physiotherapist,Troy Dopson therefore recommends these simple exercises, which should be done 2 to 3 times a week in 1 to 2 sets of 8 to 10 repetitions. The important thing here is technique and forms, making sure you do not get anywhere near the fatigue range. Also have a 1 to 2 minutes rest between each set. When lying on the floor always make sure there is a gap between your belly button and the floor as this maintains the proper pelvic posture. We also include below some examples of exercises to strengthen your ankles, as ankle sprains are so common. Lying flat on the floor, with your forehead on the floor so there is no neck flexion or extension, “set” the shoulder blades by pulling the shoulder blades together. 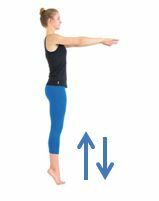 With arms straight out in front of you at 130° angle, fingers straight and thumbs pointing up, slowly lift up arms around 6-8 cm off the floor. This exercise is great for scapula stability, the function of the rotator cuff, it promotes good rotational mobility of scapula, exercises lower trapezius, and you should feel a ‘pull’ between your shoulder blades in the lower areas for the muscles are being used. Position your arms out to the side, at shoulder height with palms facing down. Lift your arms up squeezing shoulder blades together as high as you can. This exercise is great to gain the middle trapezius, to work on the posture of deltoids and also the rotator cuff functioning. Lying face down, with arms out to side, now keep your upper arms in same position but bend your elbows at 90° angle. Your fingers are turned in with thumbs still pointing up. If this is difficult it’s not because of tightness of the ligaments but because you don’t have the strength in the shoulder muscles, that’s the purpose of this exercise. Similar but put your elbows as close to your body as you can, and this time you’re moving the whole arms backwards. To strengthen the muscles in and around the ankle and improve the stability of the joint, start by making small circles. Sit on a chair and extend your right leg. Make circles to the right with your foot 20 times. Rest your leg for 5 seconds, then stretch it again, and make circles to the left 20 times. Alternate legs and do 4 sets on each side. Stand up then climb on the tip of toes (keep a support nearby if needed). Hold 10 seconds and go down. Do 5 sets of 15 repetitions. You should feel tired in your calves. If you want to increase the level, take a weight in your hands and keep it close to the body to increase the load. You can also do the exercise only on one leg, keeping the knee slightly bent. This exercise improves your control and balance on one leg. Stand on your right leg and carry left foot as far as possible in front, on the side, then behind you without touching the ground between these positions. Then return to the center. Keep the support knee slightly bent. Do 3 sets of 30 seconds, and then change leg. To progress, you can do the same exercise with a cushion or a folded towel under your foot or by closing your eyes.